The Highwayman by Alfred Noyes | What a Beautiful Mess! I know that’s a long read, but believe me, it’s so worth it! This poem has captivated me for so many years and I just felt that this picture had this kind of mood. No, I’m not the landlord’s black eyed daughter, but I can relate to her self sacrifice, mainly because I would do anything for the people I love. I hope it would never come to that, that I have to kill myself to save anyone, but I truly would give up my life to save someone I love. Yea, I know it sounds kind of trite, and easy to say because it hasn’t come to that, but look at the people who have lost their lives, doing the most heroic of things, and not just for people they love, but for complete strangers. The people that are completely selfless when in situations that hard choices must be made, and are done in the blink of an eye, and the ones who survive these miracles will say they’d do it again with no thought of their own safety. I can only hope I act in this way if ever in this situation. I guess a person never knows how they’ll react when in dangerous situations, but I hope I’m the one helping in any way I can, instead of leading the charge, running in the opposite direction as fast as I can while yelling, ‘Run Away!’. This shot has a lot in it, but what I really want to show is that I’m in, what I call, the master bedroom of the ‘Galveston’ home from Galland Homes. It’s part of the February Builder’s Box, which is still available in-world or on Market Place. This house has a land impact of 128 with two extremely spacious rooms for decorating ease. I’m in the second smaller room, which I’ve made into a master bedroom, complete with a fireplace and 5 windows in 3 directions, making for some amazing views while enjoying some privacy. The larger room also has a fireplace and with it’s many windows and vaulted ceilings it really makes it so versatile for many decorating styles. The front door opens out onto a small porch with a nice railing, perfect for watching the sunset in your rocking chair! Here’s a closer look at the outside! I’m sitting sadly here, using the ‘Careless Whispers’ pose from the ‘Heartache’ pose sets from Le Poppycock. There’s 2 sets, each with 6 thoughtful or sad poses with rose pose props for that lost love. They’re available at the current round of The Chapter Four. 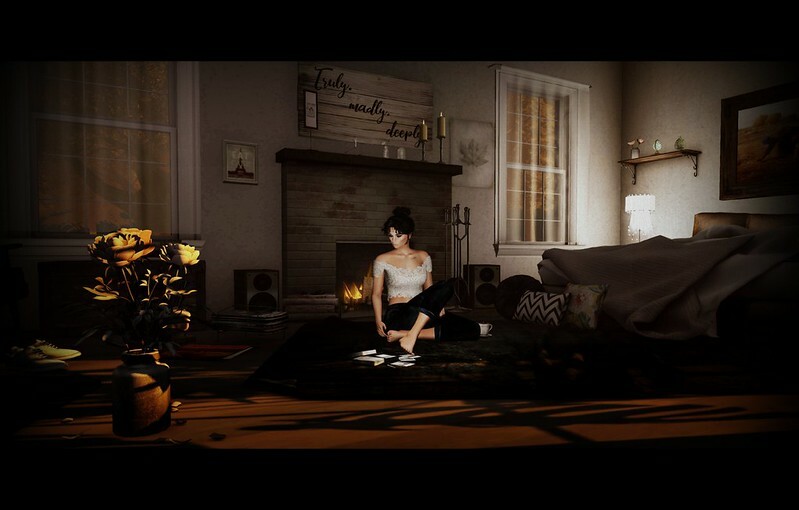 ‘Wood Speakers’, ‘Wood Turntable’, ‘Good Music Holder’, ‘Trunk’- ..::THOR::..
I’m wearing the ‘Lace Crop Top’ from ISON, the ‘Boyfriend Jeans, dark wash’ from fashionably dead, and the ‘Junghwa’ hair from MONSO. The look all starts with the ‘Raine’ skin in ‘miel’ tone from Avada on the ‘Lilo’ bento head from Catwa and the ‘Lara’ mesh body from Maitreya.